Taken at the closing. Facing south from the front of the garage. 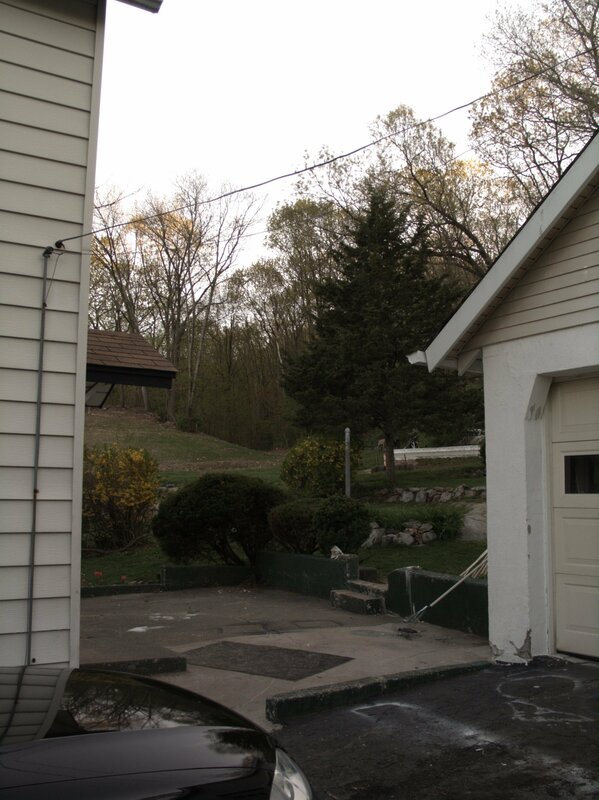 A view of the back door and concrete patio. Due to the advanced state of decay of the concrete and a drainage issue, the patio will eventually be demolished and replaced with lawn. Taken at the closing. Facing west-southwest into the backyard. The green concrete wall, steel fencepost, and several bushes in the foreground will also be removed and replaced with lawn. 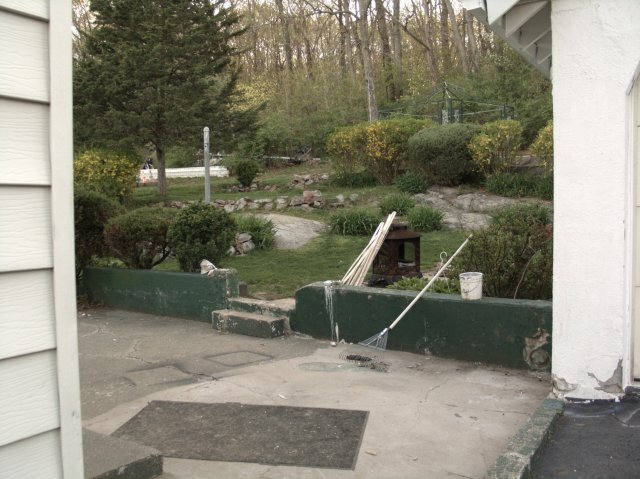 Notice the large, buried boulders and fieldstone terrace walls in the midground as the lawn slopes up from the rear of the house. The bunches of green, grass-looking plants are tiger lilies. In the background to the right is the metal framework for a pavilion/gazebo atop a rather large concrete foundation (partly obscured by more bushes). 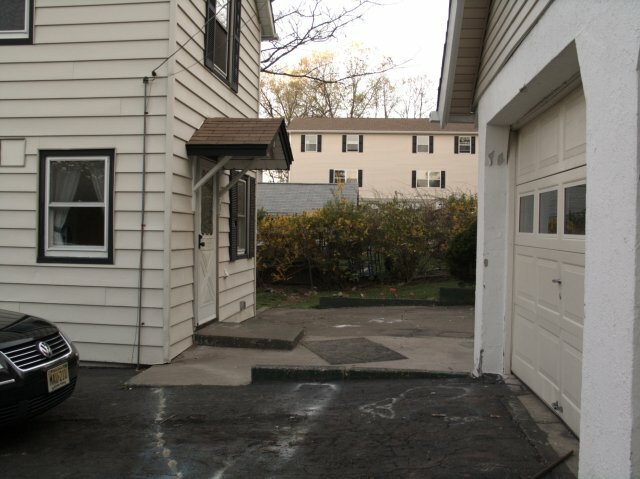 Update, October 13th, 2007: Two sticker bushes, one to the left of the steps out to the lawn and one behind the rightmost part of the wall (obstructing the garage entryway door), have been removed. God knows why people plant those horrid plants. We also managed to be rid of that steel cyclone-fence pole sticking up behind the left sticker bush. We ended up digging around it and bending it back and forth (which at times took the weight of both of us hanging on the end of it!) until it broke below ground level and then we burried it. We would have liked to have dug up the concrete ball, but there's a bunch more concrete poured over half of it - it probably would have taken a day drilling at it, and all of the concrete is slated for demolition down the road anyway. We also patched the large gaps in the patio wall and the garage with fiberglass-reinforced wall bonding cement. We are currently painting the green wall a sort of slate grey with patio-and-deck paint. Taken at the closing. Another view of the patio facing southwest from the front of the garage. The black and white markings on the driveway and patio resulted from some past careless use of spraypaint.